You need Corvette floor mats, but only the best will do. 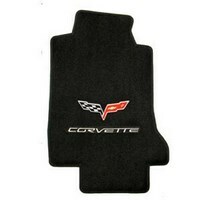 Nothing less than premium authentic Lloyd Corvette floor mats with authentic Corvette emblems are right for your car. And Lloyds has exactly what you need to complete the look. Whatever the style is of Corvette you drive, Lloyds has the right floor mats for you and for your car. 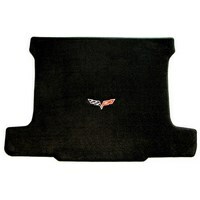 Choose the Premium Lloyds mats for your C6Z06 with the Z06 professionally embroidered on the dark ebony-colored mats. The 100% DuPont nylon embroidery yarn looks great and is guaranteed to last. Its rugged durability will retain that new look for years to come. You’ll also be assured that these mats won’t move or slip. The rugged and durable rubber backing has the right traction to keep that mats in place where they belong. These Premium Lloyds mats have a plush 5/16” nap, are water resistant, and come with a manufacturer’s warranty for five years. If you’re looking for one of the rubber Corvette floor mats, you will find them for the Corvette C5 or the C6 from Lloys also. These durable Lloyd Rubbertite mats provide great protection for your car because of their ability to hold dirt and snow and gravel away from the flooring itself. These mats are flexible and heavy without being too bulky. Choose from black, gray, tan or transparent mats and enjoy super fast, super easy cleaning with just a hose. Every Corvette floor mat from Lloyds is covered with a protective coating of latex, and each mat has a great fit that completes the look for your specific Corvette model. Check out Floyds floor mats and get the best for your car.